We are a leading Manufacturer of medical grade pvc tubing from Ahmedabad, India. A prominent manufacturer and supplier, we offer quality range of Medical Grade PVC Tubing. 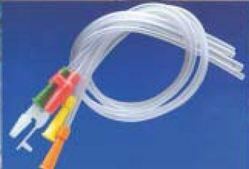 These non toxic medical grade tubing are provided with vented protective caps at their ends. Clients can avail these E.T.O. sterile and pyrogen free tubing from us in different lengths at affordable prices.